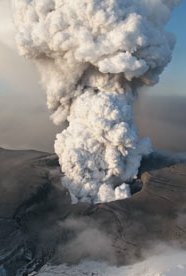 One of the daftest questions asked by reporters and journalists over the last few days is ‘are we going to get more of this ash in the future?’ It’s a bit like asking if there are going to be any more earthquakes in those parts of the world known to have had recent earthquakes (well, I’m sure you know what I mean). The short answer to their question is yes. The long answer is that Iceland is on the geologically active mid-Atlantic Ridge, where volcanic eruptions have been commonplace since everything on this side of the Atlantic split from everything on that side of the Atlantic at least 200 million years ago. So, it’s time we got used to it. What has changed so much recently is the weather, and the way the ash clouds move and disperse. The likelihood is that many – if not all – of these climate changes are our own fault anyway. And, because aircraft contribute to the pollution of our skies, we shouldn’t grumble too much when they are grounded. As for the timing of eruptions, it’s rather like predicting earthquakes: the further we are from the last, the closer we are to the next. I have cheated, though not seriously. 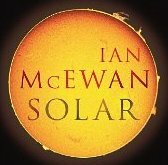 I intended to buy Ian McEwan’s latest novel, Solar, but instead I bought the book on CD, read by Roger Allam (who I haven’t heard of before but who read the book faultlessly). I do this sometimes. I have close relatives in Bristol and the tedious drive (a round trip of almost 800 miles that the car and my subconscious mind seem to manage on their own. Almost…) is made more bearable by having a novel to listen to during the journey. Particularly in that nasty bit of the M6 between Manchester and Birmingham. The CD set is unabridged and the reading is 11½ hours long, therefore lasting for most of the journey there and back. Puzzlingly, the book has had some unfavourable reviews. Could that be because the author addresses climate change in a thoroughly researched manner that disturbs his readers? My humble (perhaps not so humble) opinion is that this novel will become a classic. Some of you know that I write. But in McEwen I marvel, I can’t even get close. I am gobsmacked (a technical term I learned years ago) that McEwen, a graduate in English Literature, can have such a grasp of physics to have written such a novel. But don’t let the word physics put you off. Solar is GOOD STUFF, as a university friend of mine used to say. It is serious and amusing, and I wish I could write like that. I loved his novel Atonement, and Joe Wright’s film of it (perhaps, one day, if I have the guts to do it, I shall tell you why). Attempted, unsucessfully, to write in Starbucks this morning. Not because the muse had left me, but because of the earbashing piped music, jazz on a solo tenor sax, strangled by tinny speakers that pitched it around castrato – as if it wasn’t bad enough already. Struggled on, as one does, wanting to be somewhere else but not wanting to bolt my latte and mini cheese and ham muchies (that I rather like). Developed a gradually worstening brain pain. Bye bye Starbucks, hello Nero and Mr Costa. Interesting stuff now appearing in blogs and on Twitter about electronic publishing. I get the impression that agents and the publishing industry are running scared. Maybe running isn’t the right word. Ambling, then. It’s rather like the world’s attitute to climate change: we know it is going to be serious, but nobody seems willing to do much about it.